Whether it’s 1 room or an open layout, it’s ideal to have 2 wood tones (3 max) in a space, any more than that and you risk things looking hodge-podge (which is a super technical term, I know). It’s also VITAL that the undertones in your wood finishes are coordinating. PS. For those of you looking for pretty pictures, you’ll find this post amazingly underwhelming – it’s more a ‘learn how to’ rather than a ‘pretty picture’ post. This post was updated in Dec 2017. Whether you’re picking a new wood product or trying to coordinate with an existing one, you need to figure out which undertone it has. Undertone is the ‘colour’ of the wood, as in, ‘yellow/orange/red/purple/green’. The undertone will directly affect your choice of paint colour, other wood finishes, furnishings, your sanity, and more. 1. Compare. 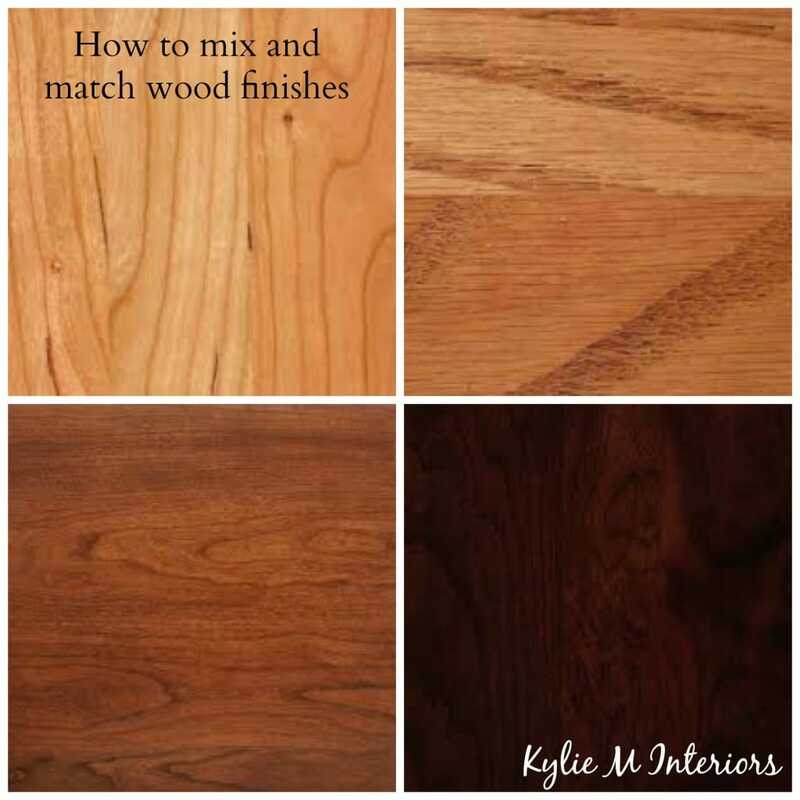 Comparing different woods to each other can make the undertones easier to see. 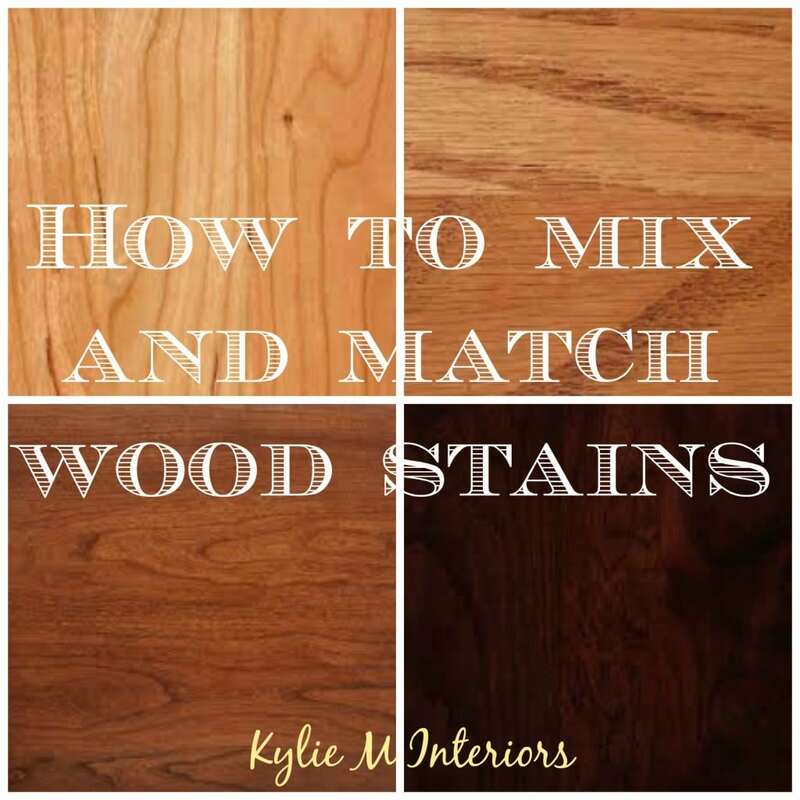 If you are choosing new wood flooring or cabinets, lay a few ‘similar’ samples next to each other. You should see a shift from one colour to another and can eliminate the undertones that you want to avoid. And it’s VITAL that you do this in your own home, not in the store, as store lighting always skews things – as does a glass of wine, so have a drink after you’ve picked your fave. 2. Ask a professional. Whether it’s a flooring store or the paint dept (or me!) a professional should be able to let you know the ‘basic underlying colour’ in your wood stain. If you can’t bring a sample to them, take a quality photograph and they should be able to give you the general idea. Oak. While it might not be the most popular wood for cabinets these days, it’s timeless when it comes to flooring…as long as you have the right stain colour. What coordinates and what doesn’t? Top left and bottom right: These 2 coordinate without being matchy-matchy (as pink is really a light version of red). Top left and top right/bottom left and bottom right: The undertones totally clash even though they are in the same wood family. Maple. One of the most popular and versatile stain colours as all maple stains are clearly not created equal! Middle left and top right: Even though they are similar in depth to each other, their undertones are too different to look good. Espresso. And yes, I do realize that ‘espresso’ does not come from a tree (it comes from a coffee machine and is necessary to my survival) but it is a very popular stain. The espresso finish can change drastically depending on what type of wood it is on. Notice how it can even take on a greenish hue when applied to some oaks. Middle left and middle right: CAn you see that flash of green in the middle left? Hot mess alert! Top left and bottom left. They look soft and pretty together. Above: Espresso is one of the easiest stain colours to coordinate with as the undertone tends to be the most neutral and often leans toward the purple end of things. Hi, I need you help! In my kitchen I have hickory cabinets (lots of them). My husband refuses to paint. I am okay with that for now. Our walls are painted a warm stone. The flooring is linoleum. Yuck! We are looking at Pergo flooring but I am not sure if I should go with a wood or tile look. Any suggestions would be awesome! Thanks so much!! Is there a general rule that stair risers should always be white or are there times when stained risers ( the same as the floor and treads) work better? We have solid hardwood throughout the main floor with white dove trim. Can’t decide! Nope, there is no rule at all – it’s personal preference! Now it’s usually easier to have painted risers than stained ones if you’re renovating…you know what, I’m going to do a blog post on this – you’re a genius! Anyway, the gist is it more depends on the look you are wanting. I also find that the painted riser can give some visual relief when there is A LOT of wood in a home…. Thanks for asking my friend! This is a fantastic, useful post. So often I have questions about decorating, and go to the internet hoping, but not expecting, to find some useful information. Not only did your post answer my question, but it gives excellent, excellent information. Thanks so much. I have cherry plank flooring and light grey walls. I don’t want white cabinets for kitchen due to maintenance issues. What other colors wud look great with cherry floor and grey walls. I’ll select the counter top granite once cabinet colors are decided. Hi Shubha, it depends on what type of gray is on your walls, but you could do a gray that is contrasting from your walls, so either lighter or darker by a few tones, or maybe a blue/green/gray blend? I would like some help! I have maple cabinets with a pink undertone. I am refinishing my red oak hardwood floors and would like to do a gray stain. Will the floors take on a pink tone? Is there a stain color we could mix with the gray to offset the pink tone? Any advice would be appreciated. I have a honey oak spiral staircase (yellow tones according to your very helpful chart). For the front foyer, I’m considering an ivory porcelain tile (Edgecomb Grey walls) but I would like to replace the old tired broadloom between the stairs and the tile with Preverco Wheat or Preverco Santa Fe Nuance oak flooring. The Wheat looks more yellow online than it does in the store and is a lighter brown than the Santa Fe. Any thoughts? The oak will be continued into the family room (BM Jack Pine) while the tile could be extended throughout the foyer and down a short hall into the laundry and powder room (BM Muslin / Ballet White). I am definitely struggling with the three types of flooring in this front foyer area. Your talented input will certainly be appreciated!